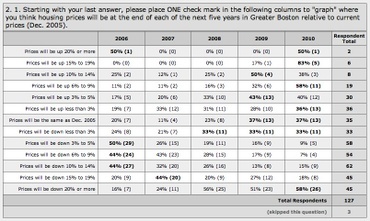 The Boston Globe is asking readers whether prices will keep falling, remain steady, or begin to rise again in 2007. We asked our blog readers a similar question last year, but as the responses above show, wanted them to graph price changes through the end of the decade. We’d be glad to repeat that survey, but for now, just want to know whether you will make your own 2007 real estate resolutions based on where prices will be over the next 12 months or five years? Does it make a difference? Let us know what you think about what one industry spokesperson says about playing the "Waiting game."